Securing your smartphone against theft is no small matter. Whether you leave it behind in a cab or at a restaurant, or someone outright steals it, undoing the damage of all that data loss can be a lengthy nightmare. And hey, smartphones aren't cheap! But there’s no reason to suffer through this. There are plenty of good applications in the Play Store, and probably a couple that come pre-installed on your phone, that make sure your device is properly secured should it grow legs and walk away. Along with following Google’s security tips, you should look at one of the following services to make sure you can remotely lock, wipe, or seek out the location of your wayward phone. Google offers its own solution with Android Device Manager, and like most of its services it works best if you stick close to Google’s ecosystem. 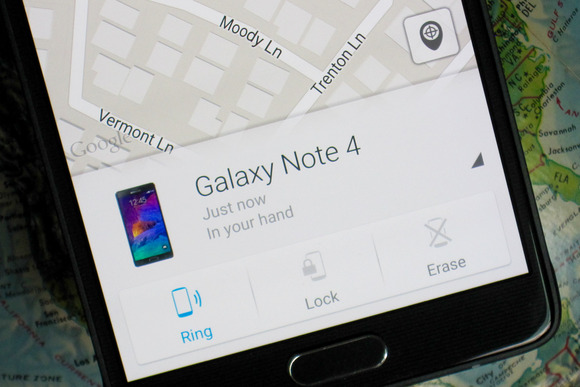 It can locate your phone on a map, make it ring, and lock it, or totally wipe it. Google recently unveiled the ability to type “find my phone” into Google search in order to pull up a map of where your device is located. 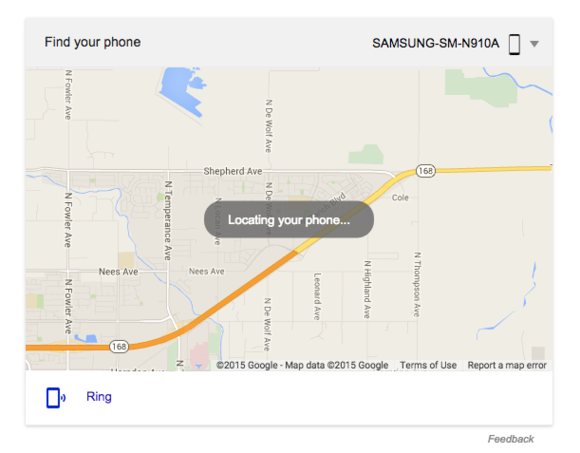 You can track down your device by typing into Google, “Where’s my phone” if you’re using Android Device Manager. If you’re using Chrome and signed in to your Google account, it’s a simple as opening a new tab and typing the magic phrase. I tried this out recently and ran into one hangup. It asked me to sign in again to my Google account, which required a text message via two-step authentication (I’d recently cleaned out my cookies). If I was actually missing my phone, that could induce temporary panic. You won’t completely be out of luck, as I was able to login to the Android Device Manager site without going through the two-step process. It’s likely just another security layer to keep some random person from Googling the location of your phone if you’ve walked away from your computer. If you’re seeking a security solution that does more then track down your missing phone, then Lookout has a lot to offer. Most of the goodies come in the paid version, which can also back up your photos, call history, and provide you with a secure browser. It also scans your apps for malware, though if you stick to the Play Store you’re extremely unlikely to run into such problems. Lookout packs in a ton of security features along with the ability to find your missing phone. Its signature feature is Theft Alerts, which will take a picture with the front-facing camera during suspicious activity. For example, you can direct your phone to go into this spy mode if there are too many incorrect PINs entered, if one tries to uninstall Lookout, or if a SIM card has been removed. These of course require the premium plan, which is $2.99 per month or $29.99 yearly. 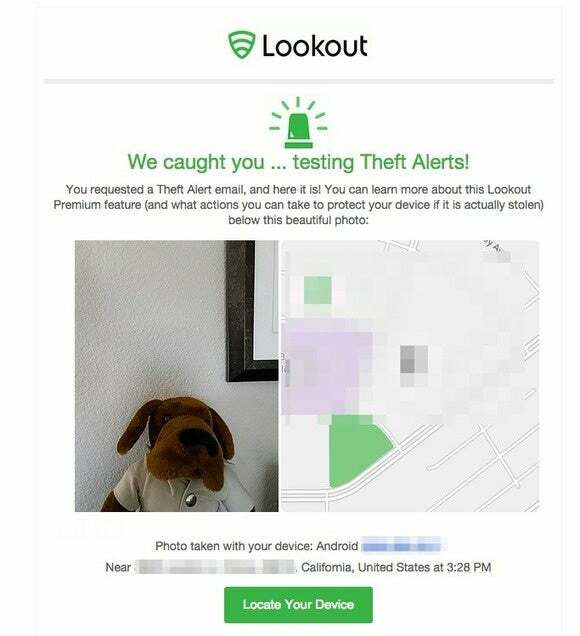 Lookout will take a picture of any unsavory characters who may be trying to steal your phone. Another advantage of Lookout is that it’s cross-platform, so you can use it to manage any iOS devices you or family members have along with your Android phones and tablets. A premium account allows you a total of three active devices, while free accounts restrict you to two. If you’re not too keen on the idea of a monthly fee then Cerberus may be a good choice. It does require you to pay up, but it’s a one time fee of €4.99, which is currently about $5.67. Cerberus offers a ton of options for customizing your phone's security. Cerberus (named after the three-headed dog of Greek mythology) has several options for directing your phone to lock itself down. For example, you can tell it to start recording audio with the microphone or sound an alarm if someone tries to reset it or remove the SIM card. It also will hide the app icon, so if someone gets a hold of your phone they can’t easily disable Cerberus. Along with tracking, you’re able to send a number of commands to your device, like turning on Bluetooth or wiping the memory. The web interface is stuck in the past, but it includes these commands and others so you can track or wipe your phone remotely. Prey is another good choice if you want something cross-platform that can keep tabs on multiple devices. You can sound an alarm with your phone, send it a message, or lock it down if it goes missing. You can access these through Prey’s well-designed web portal. The free version will keep tabs on up to three devices. The entry-level upgrade gets you 10 devices for $15 per month. Prey has several plans for businesses, including a $399 per month option for up to 500 devices. Prey can handle all your devices whether they be Android or iOS. It also can hide the Prey icon so no thief can tinker with your settings. You can also disable the power button, so your device can’t be turned off if the screen is locked. If you have the Galaxy S6, Note 4, or other popular modern Samsung device you’ll find a security solution baked right in. The key here is convenience—it just takes a couple of steps to ensure that it’s up and running on your device. 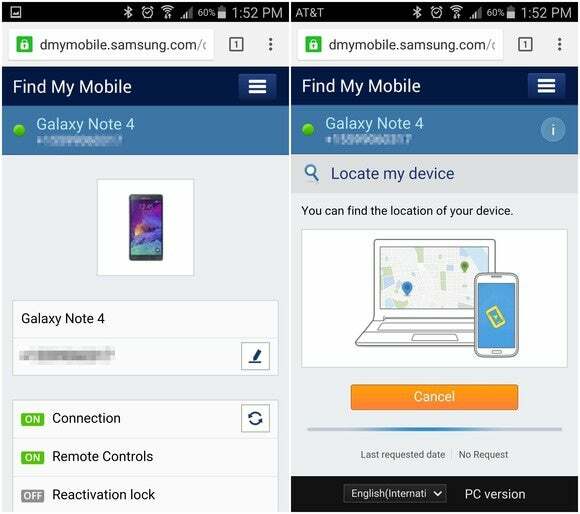 And just like Android Device Manager, you can log in to Samsung’s find my phone site from any browser to track it down. From there you can lock, alert it, or use the GPS details to see if you can find it. 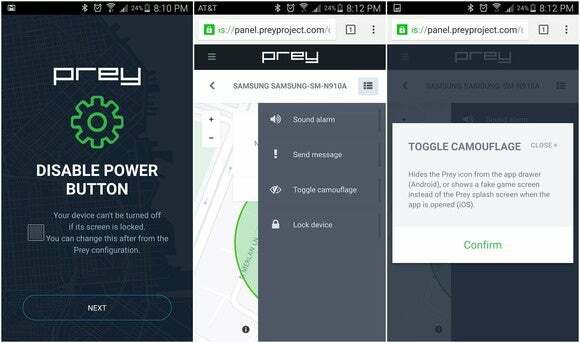 Samsung’s built-in app can find your phone with the app or from the web. The tools are bare bones compared to some of the alternatives, but at least it’s there in case you think you’ve left your phone somewhere. Using this requires Samsung account, which you’ll need to set up if this is your first Galaxy phone. It’s worth having in case you take advantage of Samsung’s other services, of which there are many. Find-your-phone solutions are good, but they shouldn’t be your only method of security. Those in the know recommend that you consider a find-your-phone app as the last line of defense, not the first. Also, don’t presume that your device is free from tampering just because you have a PIN or fingerprint lock on it. Ashley Hamilton of WhiteHat Security says even a fingerprint reader, like the one found on the Galaxy S6, isn’t enough. One solution for minimizing the annoyance with such a password would be to use Google’s trusted places feature, which disables the need for password prompts if you’re at home or another location you set. Another item that too many people ignore is standard backup procedures, according to Bob O’Donnell, founder and chief analyst for Technalysis Research. Backing up is key because no matter how much security you use, there’s always a chance for it to be broken. He also said too many people overlook backing up their device. 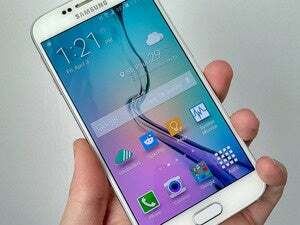 For Android, your specific manufacturer may have a backup solution, like Samsung’s Kies software or HTC Backup. Security aside, backing up your device protects things you can't replace, like photos, in case you do something like drop your phone and break it forever. Also, devices that ship with Lollipop (Android 5.0 or later) have a much improved restore solution when you start a new phone, so if most of your stuff is in your Google account you should be OK. The bottom line is that your smartphone is the most personal computing device ever made, so you should consider how much sensitive information you have on there and what risk you’re willing to accept for it to wind up in the wrong hands.